Caving in Ontario – (the difference between caving and spelunking), originally uploaded by Mic2006. This is an extract from my book (a screen shot of part of a page), that is finished as of now – with about a half hour before the new year. It should be available for purchase from Lulu or the Edgehill Press site within about 2 or 3 days (depending upon the size of their backlog). You would not believe the complications at the final stage of preparation. I have spent my every spare minute since the last post uploading, downloading, readjusting, making PDFs, more uploading, using photoshop, learning how to do things I never wanted to do; any way it’s done and the book looks amazing. This section of page from my new book, “Caving in Ontario; Exploring Buried Karst”, speaks a little about how cavers see spelunkers. To be called a spelunker by a caver is a derogatory remark. So the point is, and I need to make it quick, as there is no more than about a half hour before midnight(new Years Eve) and I have a big glass of scotch and my hot tub waiting – if you are a caver, or underground explorer of any type, somewhere near Ontario, this book is a must have (excuse the massive sentence). 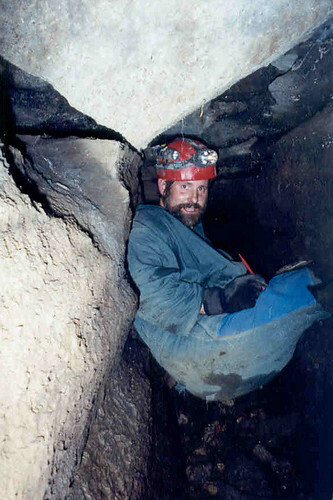 Caving in Ontario tells you about the caves, how to find the caves, the geography of Ontario, the geology of Ontario and the culture of the sport of caving (in Ontario). Caving in Ontario is in full color, and it contains information and pictures of places that have never been publicly seen or written of before. You think you know Ontario? I bet most have not seen it from this angle – a caver’s angle (looking from below). Leopard Tank – Reforger, Germany, originally uploaded by Mic2006. An odd thing happened to me while I was in Germany. I was injured in a tank accident and I still bear the scar on my forehead. This is me posing in front of one of the tanks – can’t remember which one it was, but some of the vehicles in the background are M113s – used for carrying the infantry sections that add to the “punch” of a mechanized brigade. We are in an armored defensive position somewhere in Hohenfels. 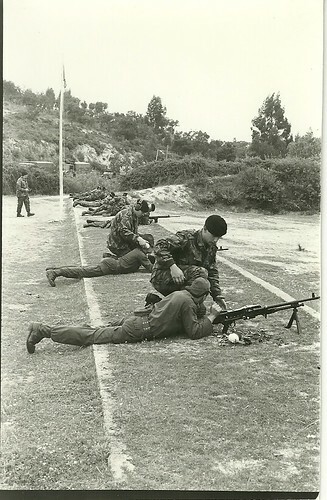 Being new I was still in the process of experiencing the 4th Canadian Mechanized Brigade Grouping, understanding who does what and how it all fit together. 4 CMBG was tasked with plugging an Eastern Bloc advance if things ever came to that – thankfully they didn’t as it’s unlikely that I’d be telling this story if it had. Shortly after this picture was taken I found myself in the gunners seat of one of these tanks (Leopard). It was nauseating as the whole turret spins both on top of the tank and in a cone down inside the cursed thing. The Leopard tank cruises in excess of 60 kilometers an hour and so as you hit trees, holes and whatever at those speeds, going backwards,sideways and all ways with no visibility beyond this scope thing in front of you it doesn’t take you long to start feeling motion sickness. The tank can keep going forward on its own long after the crew within it has been battered to death by impacts – it is a truly terrifying machine whose purpose is to crush, incinerate and kill other people in trenches, lesser tanks, houses or wherever they may be hiding. In retrospect – being part of a tank crew – its an odd kind of career to aspire to (but someone has to do it!). I can’t remember exactly what the reason was, but the other 3 members of the crew had these tanker helmets on and I did not. The crew commander kept shouting to get my face against the sight, but every time I tried we would hit a tree or a hole and it felt like somebody had just punched me in the nose. Incidentally, a tree in a Leopard at 65 KM/hr is not quite the shock that you’d imagine,it’s generally just a bump. I can’t imagine that anyone can actually sight onto a target like that – they had to be having some fun with me (because I was new???). Having already thrown up I kept trying to do as instructed when suddenly the tank bottomed out into a large crater and I hit the sight full impact in the forehead. I remember the incline when the tank stopped and we were tipped well forward and then the engines gunned and the tank backed up onto a level and started off again. The crew commander and radio operator also took it pretty hard, but the driver seemed unaffected. I couldn’t feel my face and when I reached up to see if everything was still there it was totally wet with blood. Around this time my vision started closing in and I knew I was soon to faint. I had a head set on and I was trying to figure out how to operate the thing and I could just hear my two companions shouting and what have you. The inside of a tank is cramped and full of nasty, sharp and explosive things. Worst of all, down near my feet there was a hatch that connected to the driver’s compartment and when the turret is lined up you can pass through the hatch, but when the turret is turning its like a guillotine – as I was passing out I was sliding down toward the hatch imagining that I was soon to be cut in two. I had heard that Russian tanks were even more difficult to operate, apparently there was some kind of hazard where the guy who operated the gun was sometimes caught up in the mechanism and loaded into the breach. I can only imagine that it would be lethal as a human being is not meant to fit into a tank barrel. Somebody must have heard me mumbling and gagging on the headset and they finally figured all was not well within the Leopard. Apparently it took some time to stop the thing. I was too out of it by then to know anything, but I do remember trying to find ways to wedge myself in my seat so I did not slide into the scything hatch thing. While still conscious I still had some control, but as I was passing out I rightly believed with all the shaking and slamming of the journey I’d soon be sliding into the guillotine. The driver, though he had backed the tank out of the crater was actually the most messed up of all he was kind of dazed and he just kept plowing on in shock – trees, holes, whatever was in the way just got knocked down. 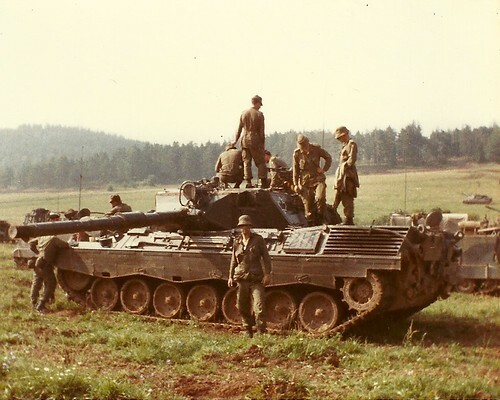 Anyway, when the tank was finally stopped, not from direction within, but by someone outside, I got hauled out on top of the tank where I was treated along with the others and sent off to a hospital. Would I want to go in another tank? – absolutely not, its a real scary machine to operate (not that I was in it long enough to get used to it) and even worse to have it coming at you – 600 km range, massive gun and quick to crush anyone who’s not fast enough to get out of the way. I believe we still have 114 of these bad boys. You can pretty well tell that this picture was taken in one of the Marmora caves. 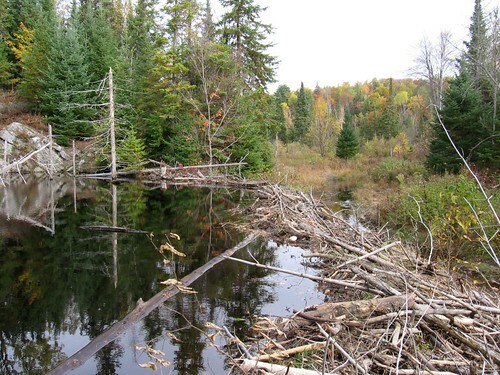 The rock in that area, though much the same as that in Dewdney’s Cave (Bobcaygeon Formation) is wickedly sharp – comparatively, the rock in Dewdney’s is much smoother. This tunnel was formed above the water table by water running along a joint, you can see the wear along the wall and the incision inward along a bedding plane. 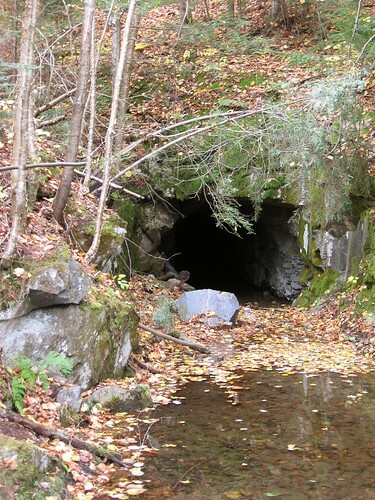 In the spring these particular tunnels are entirely submersed by running water and so bats seem not to find them suitable as a hibernaculum, in fact, in my experience, most of the tunnels in the Marmora area are unpopulated by bats. By the map in the Toronto Caver it would appear that distribution of White Nose Syndrome is on a North/South axis – in fact quite narrowly confined to certain areas. As Kirk MacGregor says, the fungus responsible for the symptoms that are referred to as “White Nose Syndrome” (Geomyces destructans) has been identified as far north as Kirkland Lake and yet at this time there is no evidence of it being east of Ottawa. Geographically you would wonder what it is that is defining the spread of disease … Travel patterns of the bat? “not being a bat scientist or anything, but would the fungus not be indicative of what is going on inside. Is the fungus growing on some kind of sputum that the bat is exhaling? What type of medium does this fungus usually grow on? Is there any connection between that and the sputum? How fast does this come on? Consider that the bat is dormant and its body temperature drops so drastically – what kind of weird virus would grow inside a creature at those temperatures? Does the bats temperature rise – might that be what is killing it? Notice in the picture(although it is only one picture), but the bats in the middle of the picture are most heavily affected and as you get further away, the fungus seems to be growing less profusely. I wonder if that suggests the bat in the middle was affected first and then the disease spread outward from him – spread in situ that is – as the bats were dormant. I wonder if the disease is even cave related as bats obviously leave the cave. Can the bat act as an incubator like the pig does in transferring influenza from the chicken to the human and mutating it along the way? Lots of questions 2 years ago and yet, no doubt answers will eventually follow. Map showing distribution of White Nose Syndrome as of 12th of May 2010. Map by Cal Butchkoski, PA Game Commission.